Okay, so I know Thanksgiving is coming up. And I love Thanksgiving. One of my favorite holidays, actually. Stuffing, turkey, sweet potatoes, green beans, pumpkin PIE….I love it all. However, I also love carbs. And cheese. And homemade bread. So bear with me during this little detour away from all things pumpkin and sage. This bread is a super fun to eat. You pull the flaky layers back to find gooey cheese and flavorful herbs. It’s melty cheese blanketed between soft, tender blankets of bread. It might seem intimidating to make, especially if you’re new to baking with yeast, but you can handle this. Believe me! My kind of spilled over the edges of the pan. Which makes me strangely giddy because I’m always afraid my bread isn’t going to rise properly. Plus I thought it made this loaf extra fun. And please give this a try. I had to refrain from eating half the loaf before dinner. We had my in-laws over and I was in the kitchen finishing up dinner and I kept sneaking bites of this bread. Although, I wasn’t too sneaky. My mother-in-law kept catching me in the act. You’d think I’d be better at sneaking food. I’ve had plenty of experience sneaking food behind my 3-year-old’s back. Note to self: work on sneaking chocolate and cheesy carbs while no one is looking. Note to self: Stop being such a fatty. Roll out dough into a rectangle about 12×20-inches in size. Brush with 3 tablespoons of the melted butter. Sprinkle with 1 teaspoon of dried basil, and all the cheese. Preheat oven to 350°F. After it has risen, drizzle remaining 1 tablespoon of melted butter over loaf. Bake for 35 minutes. Tent with foil if the top of the bread is browning too quickly. I covered mine with foil for about the last 10 minutes of baking. Enjoy warm. Serves 1. Kidding. Kind of. Verdict: Umm…yeah…I could have eaten the whole loaf. Husband’s take: He was a huge fan of this too. How could anyone not be? 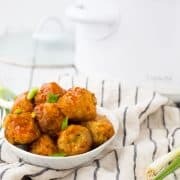 Changes I would make: More cheese? Kidding. No changes necessary. Want more pull-apart bread? I do. I made a double batch tonight. It made 3 loaves. Instead of stacking the slices, I made it into a Babka loaf. Turned out amazing! Only wish I wouldn’t have used quite so much butter. Oh yum! I love that! So glad you liked this one – thanks for taking the time to come back and leave a comment! Nice bread, thanks for your long detail tips, I want to use a bread machine to make it,can I? Bread… If there was one food on this earth that I couldn’t live without, that would be bread. I have Zojirushi bread machine and I love try different recipe with it. This is the easiest bread recipe I’ve ever come across and it is better than store-bought…I will try it and will share my opinions. Certainly it will be perfect. Can you make this by hand rather than with a stand mixer? I’ve been making 5-minute artisan bread by hand and am a baking newbie, so have not yet invested in something like a mixer yet. 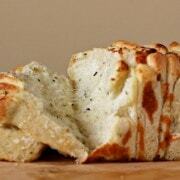 I love pull-apart breads, but have never made a savory version! This looks so great Rachel! I will be pinning for future reference! I am a bit confused. Once you have the 6 pieces stacked, I am to cut them into 6 pieces? There are 36 total pieces correct? Yes! Six slices first, then you stack those up, and slice again into 6 slices. So you end up with six stacks but 36 total pieces. Hope that helps! 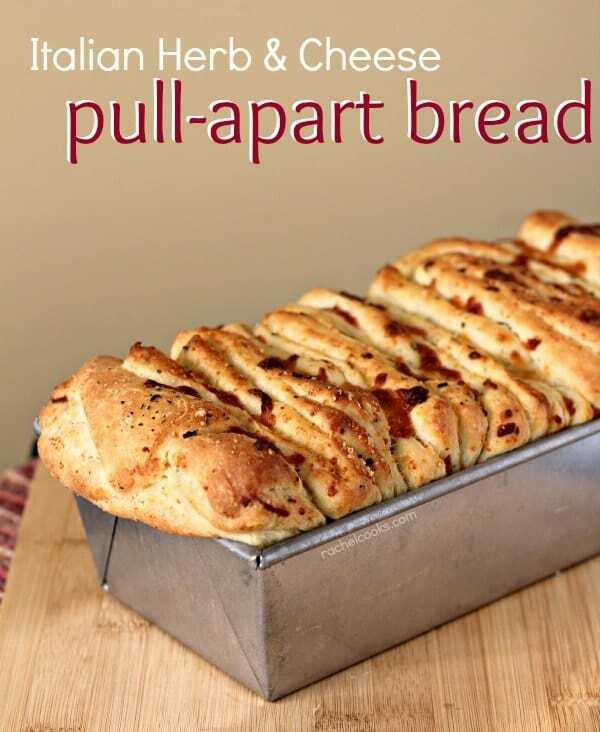 I love pull apart breads and all the cheese in this is just wonderful. Thanksgiving always calls for bread so this is perfect for the season!! You are absolutely killing me with this ooey gooey cheesy bread! Looks like magic! 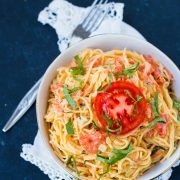 We are totally into having a huge carbfest at our family Thanksgivings and it’s all the better if it’s Italian-infused! Although…if I make this loaf it might not actually make it Thanksgiving with all the snacking on it I’ll be doing. Best make two. I have never made pull-apart bread and I am totally missing out! Pull-apart breads are the best, aren’t they? I’ve only made sweet version though, I really need to get on a savory cheese version asap! Holy cow! 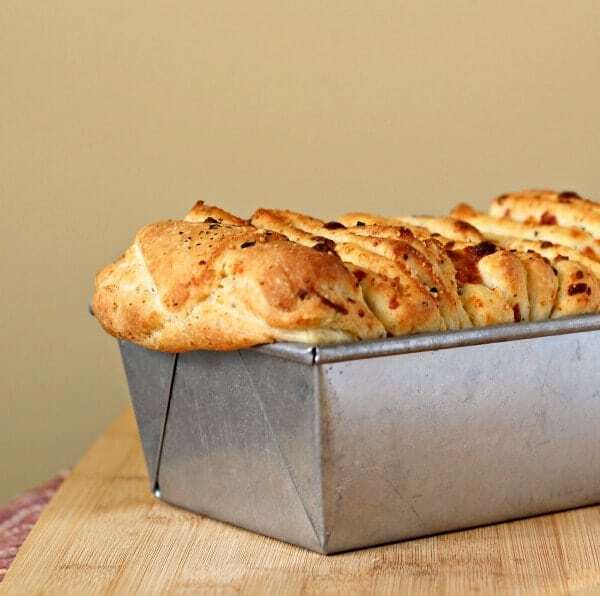 That is one gorgeous pull-apart bread. I’d have a tough time not snacking on that all day long. 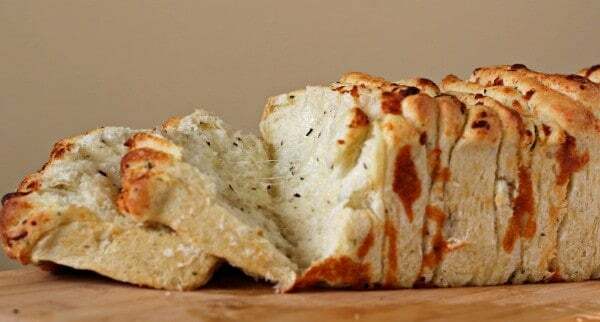 This bread looks SO delicious. I’m a bread girl all the way. I bet I could eat this whole loaf by myself! mmmm I love how cheesy this is-anything with Italian herbs and cheese is pretty much amazing in my book! How can you not eat the whole loaf?!!! Yum! I need to have this on my dinner table asap! Hubba hubba! Send me some now! Haha Loved your verdict on this one! I could have eaten the whole pan myself too! I’m a carb – bread lover and would take it over dessert any day! Haha. You know you’re a mom when you hide in the pantry to eat chips. Or chocolate. *raises hand* Nothing is ever your own ever again… I still haven’t conquered my fear of yeast, but I will add this bread to my bucket list. i was planning on not carb loading this week but this bread looks irresistible. Giiiiiiirl this is insanity. And I need it. Your bread looks fantastic. I’m a carb lover too. Thanks for the link love. This looks like fun but I do have one question. In step 4, after stacking the strips, should they be cut into 6 stacks or just 2? Seems like 6 would make the pieces too small. Never mind, I think I get it now! This would be better than a fancy dessert for me. I love it.